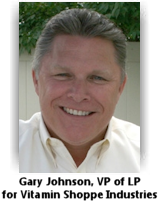 Gary Johnson, Vice President of Loss Prevention, The Vitamin Shoppe, Inc.
Just completing his two year term as Chairperson for the National Retail Federation's Loss Prevention Advisory Council this past June, The Daily wanted to share with you his prospective of the council's efforts, focus and some key accomplishments during his term. Understanding that all of the LP Advisory Council positions are voluntary assignments that these executives accept, in addition to their professional obligations with their respective retailers, you've got to respect and appreciate the dedication and extra workload that each one of these members enthusiastically invest on behalf of the Loss Prevention industry. Representing the best and brightest of our industry, these LP executives are supported by the NRF's leadership team and staff who are ultimately responsible for delivering the services, coordinating all the efforts, steering the national development and legislative agenda, developing and managing the largest retail Loss Prevention conference each and every year, and ultimately being the Voice of Retail Loss Prevention. As Chairperson of the Advisory Council, Gary had a very clear and precise mission that focused on increasing engagement and participation. Given the economic times, everyone's expanded responsibilities, the rapid pace of change going on in retail, and the customary stresses volunteer positions are under, Gary's mission was perfectly aligned with the needs of the industry. By effectively communicating and integrating his back-to-basics mission throughout his two year term Gary, the Advisory Council members and the NRF LP team were able to keep people focused on a core development need that helped produce record breaking attendance at the NRF LP Show with a robust slate of educational offerings. The Advisory Council continued the fight on the ORC front and continued to push for passage of Federal Legislation. Though many States have passed ORC legislation the NRF continues to push for a Federal tool that will provide LP and Law Enforcement with a valuable tool. - The Women in LP Caucus, which celebrated their 10-year anniversary, continued to excel with a dynamic slate of development opportunities through the Mentor Program and Leadership Conference call series that many in the LP community took advantage of. - And of course the Conference Planning Committee worked alongside the NRF partners to deliver an outstanding Conference this year. Based on feedback Gary received, by all accounts it set a new standard for the Industry. This is a cornerstone event and Steve Ippolito, who will be taking the reins from Alan Tague, has the enthusiasm, dedication, and drive to make it even better! - New talent was added to the Advisory Council with an infusion of new members – Charles Delgado, Steve Fahey, Chris Hackler, and Scott McBride—all three of which are impact players and in the coming year the Council will feel their enthusiasm and passion for our Industry which will add value. Gary, the entire Advisory Council, and the NRF team did a remarkable job over the last two years and delivered great results as evidenced by the increased attendance at the LP show and participation on the part of the entire Loss Prevention community. It certainly validates the academic requirement of developing and communicating a mission statement that drives your efforts and helps your organization and team reach its goals. Job well done Gary!